On Sunday we celebrated the greatest and most difficult calling in the world…being mom. I wanted to use this Mama Monday post as a spinoff of the sermon Preacher Man gave this Sunday about Jochebed, the mother of Moses (Numbers 26:59). When you’re in the trenches doing the most important job in the world, you need all of the encouragement you can get! In Exodus 1:22 the Bible tells us that Pharaoh gave the command for all Hebrew baby boys to be thrown in the Nile River, but only the girls could live. The reason for this extreme act is because the current king of Egypt was concerned that the Hebrew nation had become too large and powerful. He was afraid that they would rise up against the Egyptians (Exodus 1:8-10). During this time, Jochebed, who had already given birth to at least two children, Aaron and Miriam, gives birth to another baby, a boy. She hides him for as long as she can, but eventually she knows she must do something or the Egyptians will find him and throw him in the river. This mother was willing to stand up against the strongest empire of that time to do what God had said and what her mother instincts told her to do. Protect her child. Today as mothers we are also called to obey God, to do what He commands, not what society or the government says is the proper way to be a mom. Sometimes these spheres may overlap, but ultimately we must obey God when it comes to raising our children. What Jochebed does next sends chills down my spine and puts humility in my heart. 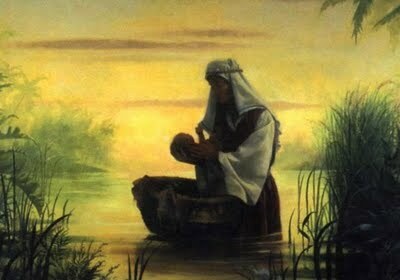 She makes a basket for him, covers the basket with tar so it’s waterproof, lays the baby, who is three months old by this time, inside, and then puts the basket in the Nile River (Exodus 2:1-3). Although the Bible doesn’t tell us I’m sure this mother was beseeching God repeatedly to take care of her precious baby, to give him a chance at some kind of life so that he would not die at the hand of the Egyptians. Ultimately, though, this act shows us the depth of Jochebed’s faith. She is trusting God to take care of her son. At some point all of us will have to send our children out on their own as well. At that point, we need to have the faith of Jochebed that God will take care of them. She did everything in her power to take care of her son by hiding him as long as possible and providing him a safe vessel to make his journey, but now she puts her son into God’s care and lets go. Jochebed takes advantage of her time. And God does take care of the baby. In fact, He brings him back to his mother. Pharaoh’s daughter finds the basket holding Jochebed’s son while she is bathing in the river and decides to keep him. At this point we discover that not only does Jochebed love her son, not only is God watching out for him, but his big sister, Miriam, has been following the basket that holds her baby brother. When Pharaoh’s daughter decides to adopt the baby, whom she names Moses, as her own, Miriam steps up and volunteers to find a wet nurse for the baby. Of course, she goes to get her mother and Moses’ mother. At this point Jochebed is hired to take care of her own son until he is older and she brings him back to Pharaoh’s daughter to live with her (Exodus 2:4-10). This gives Jochebed precious, little time to teach her son the ways of the Israelites and to teach him about the true God. We aren't sure how long she is his nurse, but we do know that the time Jochebed had with him, she used wisely. Moses grows up in Pharaoh’s household as an Egyptian, but he identifies with the Hebrews (Exodus 2:11). Why? It is easy to see, that it is because of the few years that Jochebed had with him to instill a love of God and his true Hebrew heritage. Even though we may have more time with our children than Jochebed did with Moses, ultimately the time that our children will be under our roof is short. We need to feel the urgency that Jochebed did. We need to make sure that we are teaching our children their true identity as children of God and teaching them to love Him with all of their heart, soul, and strength (Deuteronomy 6:5). Jochebed is blessed with three powerhouses for God. We don’t know if Jochebed is alive when Moses returns 40 years later after leaving Egypt, but we can see the legacy of this godly woman. Not only does her legacy live on in Moses, but she leaves behind Aaron and Miriam too. Moses is the lawgiver; he is portrayed many times in scripture as being second only to Jesus himself. Aaron and his descendents become the high priests of God’s people (Exodus 28:1). They lead the people of God in worship for hundreds of years. Miriam becomes a prophetess of God (Exodus 15:20). Of course, all three of them have their moments of weakness and sin, but ultimately we can see the unifying force of these three servants of God. They had a mother who obeyed, who had faith, and who taught them to do the same. Imagine the power and influence that we have today as Christian mothers. The power to raise our children in the Lord and leave a legacy that reaches far into future generations. Praying for all mothers everywhere to be encouraged and enjoy this challenging work laid at our feet. My girls and I just watched the animated movie, Prince of Egypt after reading about Moses in SOTW. I have to admit I got chills at that scene where the basket floats away. It's a powerful moment. I can't even imagine doing something like that with one of my kids even if their life was in danger. We love that movie as well! Faithful moms are truly a blessing. Most definitely. It's a humbling goal. I can't imagine being that strong. There is a fiction book series on WWII and Israel becoming a nation, The Zion Covenant series...anyways, there is a chapter when the mostly Germany speaking city of Danzig was allowing Jewish parents to send their children away on ships to England before they were occupied and the writers compared it to the moment when Moses's mother pushed the basket away, it still makes me tear up to think about it. I'll have to look for the book. I don't think it would ever be easy to let your child leave knowing that you would probably never see them again.